DOWNLITE has always been committed to responsibly sourcing our natural materials. We work closely with suppliers to get material from animals that have not been live plucked and have been treated ethically. More recently, DOWNLITE worked closely with two of our outerwear partners to assist in developing standards for responsible sourcing. Today, those two standards are common place in the market for apparel and reaching further into other markets. Where Do We Get Down From? We source material from all over the globe. The majority of material comes from either China or Europe. We also have a supply chain in the United States. All different qualities can be provided. 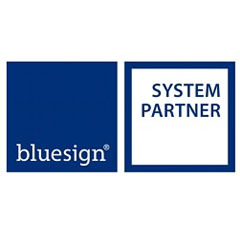 Our teams in the U.S., Europe, and Asia provide quality checks at each step of the process. And much of our material comes to the U.S.A. for sterilization and final processing - where we work hard to ensure it nearly doubles the U.S. cleanliness standards. DOWNLITE is RDS certified and we bring in more material each month that carries this 3rd party certification. The standard was created by The North Face to help ensure traceability and responsibility for feather & down material. 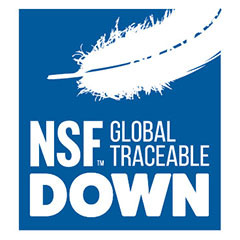 DOWNLITE is TDS/NSF certified and can provide various qualities of down & feather that carry the certification. The standard was created by Patagonia to help ensure traceability and responsibility for feather & down material. 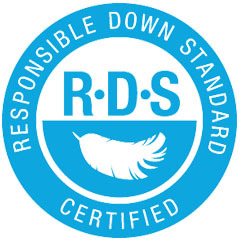 DOWNLITE uses soaps and chemistries for our down & feather processing that are certified by blue sign. Chemistries are florine-free.